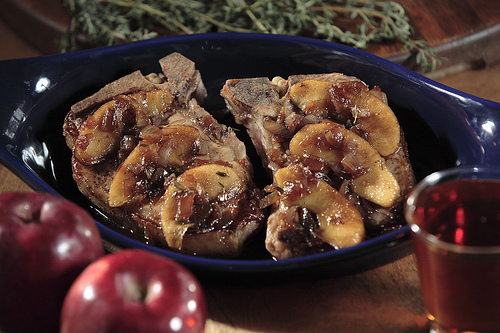 This recipe provides a wonderful opportunity to use some of the last fresh apples of the season. While apple picking opportunities are likely rare (depending on where you live, at least in New England), locally sourced apples are still available at a lot of markets. Preheat oven to 350 F. Salt and pepper both sides of chops. Melt 1 T of butter in large oven-proof casserole dish. Coombs chops at high heat for about one minute each side. Remove chops from pan and set aside. Reduce heat to medium low and melt remaining 1 T of butter in same pan. Add onion and apples and sauté until onions are transparent, about two minutes. Add syrup, vinegar and thyme and reduce heat to low for another five minutes or until apples begin to soften. Return chops to pan and cover. Place in oven for 20 minutes or until pork is cooked through. Depending on thickness of sauce, remove chops and reduce on oven top for another three minutes and spoon over chops. Season with salt and pepper to taste. Serves four.